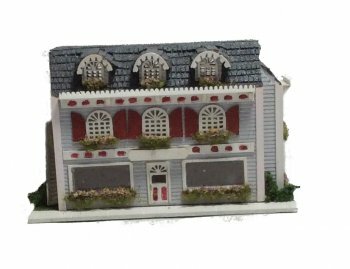 The Victorian Style Store Front features large picture windows for the first floor store area, rounded pediment windows for the 2nd & 3rd floor living area, large bay like bump on one side, & ornate gingerbread trims. The special additions to this house are the stair cases; one exterior staircase leading up to the living area and one interior staircase leading up to the 3rd floor. The interior is designed for the first floor store with 5 living area rooms: halls, kitchen/dining room, living room, bedroom, nursery/child’s room. This kit includes all materials needed to completely finish the interior and exterior of the house. The structural pieces are laser cut. The kit includes the base, three floors that are etched to resemble hardwood flooring, and 4 interior walls. The exterior materials include precut siding, shingle, gingerbread trims, and corner trims. The interior materials include wallpaper, baseboards, cove molding, and trims for the edges of the walls and floors. Also included are all laser cut parts for doors, window casings, window frames, shutters, and window boxes. This kit includes the parts for 2 staircases and a sign. Landscaping materials include grass, bushes, foliage for window boxes and vines, and 2 bags of flowers; one mixed flowers for window boxes, one color for bushes and vines. The step by step instructions are detailed with diagrams and pictures. It is important to note that our house kits include everything you will need to complete the house as shown except the paint, tools, and glue.